President Rajapaksa wanted the Judicial Services Commission (JSC) to meet him regarding the functions of the JSC, but the JSC, in an official meeting, has decided not to meet anyone regarding its official functions as such discussion would be unconstitutional. It is after this meeting that the JSC has issued a statement condemning the interference it faces, the Colombo Telegraph has learnt. 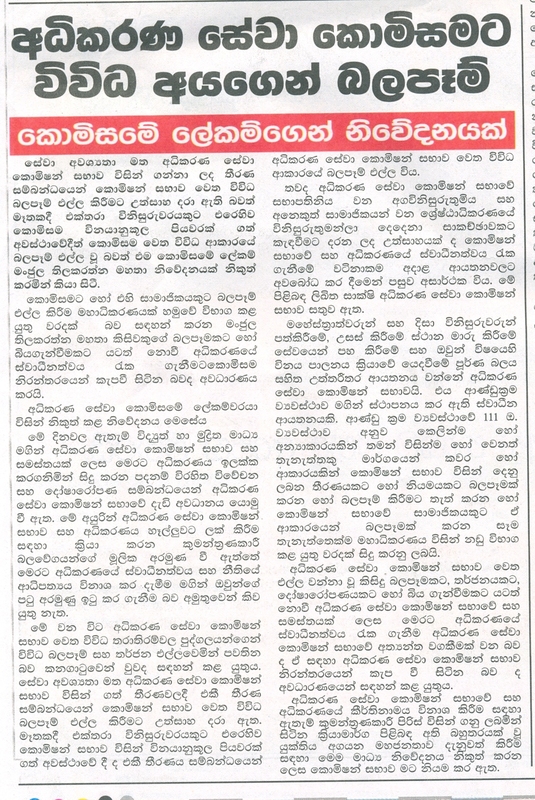 The case against the Chief Justice‘s husband is being used to twist her arm, informed sources told Colombo Telegraph. “During the hearing of the Divineguma Bill, the Bribery Commission summoned him obviously to intimidate her. Yesterday he had been again summoned by Bribery Commission. It is obvious that the NSB deal is not being investigated fully, but the Bribery Commission and CID are being used to intimidate the CJ. If the government wants to investigate into that deal, they must also investigate into the conduct of Nivard Cabraal and Ajith Devasurendra, etc. This is a selective exercise”, said a senior lawyer who wished to remain anonymous. The clash between the judiciary and the executive started with Minister Rishard Bathurdeen‘s attack on the Mannar Magistrate Courts. The President openly supported the Minister and got his close lawyers to defend Rishard. All judges struck work and lawyers demonstrated. A contempt of court against Rishard case is now pending in the Court of Appeal. The Supreme Court’s determination on the Divineguma Bill was tabled in Parliament yesterday (18 September). A government-sponsored crowd – about 3000 were assembled in the Kalapola near Parliament – transported from various locations in about 40 buses, had been orchestrated, armed with anti Supreme Court slogans. Ministers Basil Rajapaksa, Lakshman Yapa Abeywardene and Bandula Gunawardene were seen among the “protestors.” The Supreme Court decided that the Bill was unconstitutional and cannot be passed by Parliament without first being submitted to the Provincial councils for the ascertainment of their views. There are disciplinary actions against certain magistrates including Aravinda Perera, a debtor whose name is in the CRIB more than 15 times. He was interdicted. He is known to be a close friend of Namal Rajapaksa. There were attempts to reinstate him but the JSC declined. Previously Rajapaksa, High Court of Tangalle (before whom Julampitiya Amare’s cases were taken) wanted to be appointed as a High Court Commissioner after his retirement. The JSC refused and sent him on retirement at 61 years. All attempts by the highest to keep him failed. Judges Association is expected to meet today to discuss these issues.